Marching through the downtown area of Québec’s capital, protesters carried banners in favor of religious freedoms and against the proposed legislature, which seeks to secularize provincial Canadian society. 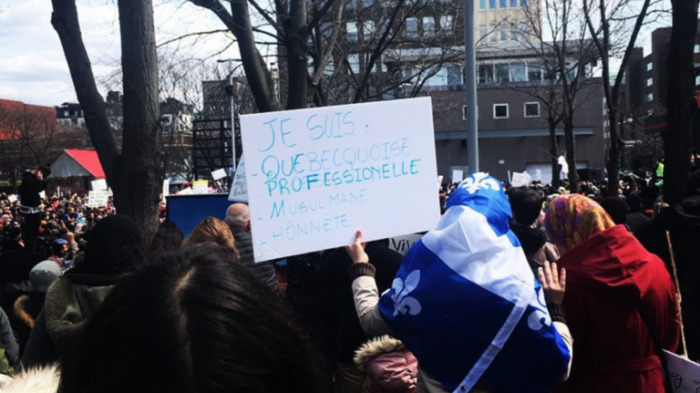 “The CAQ’s secularism bill is discriminatory and undermines the fundamental rights of religious minorities in Québec, particularly Muslim women wearing the hijab,” said Adil Charkaoui, coordinator of the Collectif Canadien Anti-Islamophobie, on the group’s Facebook event page. While the bill has provisions permitting current employees in the public sector to continue wearing religious attire (if they change job or even get promoted, they too will have to abide by the proposed law), critics of Bill 21 argue that the law will only create divisions in society by targeting minority groups, especially immigrants. Ahead of Sunday’s rally, a group of 250 university scholars wrote an open letter to the government, calling the proposed law –currently being debated by the provincial government– an attack on fundamental rights.